33,593 pounds in 2018! This year alone we took in 44% of our TOTAL materials donations EVER. Many thanks to our 4 incredible staff and many fabulous volunteers for making this possible. Many thanks to all of the folks who worked so hard to bring the the 2018 Woke and Winning Youth Action Summer Workshop Series together. Each workshop gave youth and emerging artists, 16-25 years old, the opportunity to learn from local and national activists in the fight against gun violence, and to transform their knowledge into art projects for social justice. Over multiple sessions we introduced youth to various organizations that use their platforms to promote gun reform. 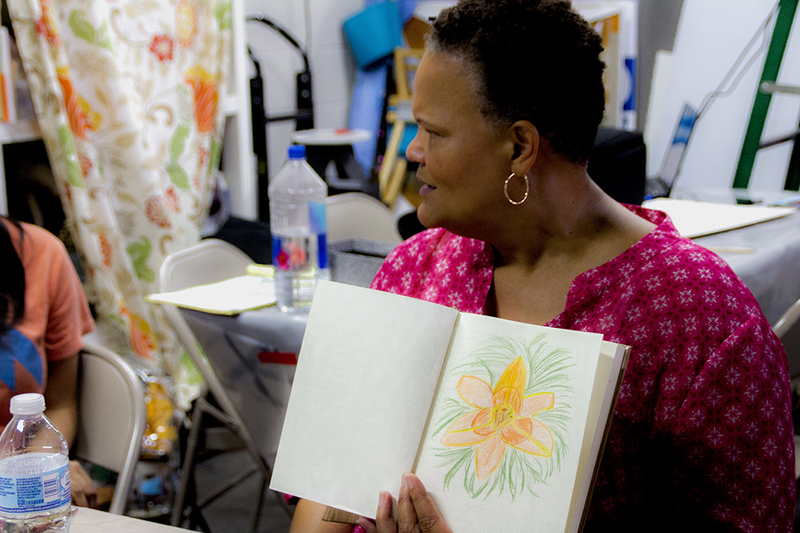 The second half of each workshop offered emerging artists a master art class with our Education Coordinator, Liz Gomez, and a concluding Art-Making for Awareness studio project meant to connect participants to the broader community. Funding for Woke and Winning Workshops was provided by a generous grant from the Safe and Peaceful Communities Fund. Why is community-based programming important? Community-based programming is a way to activate the resources within our community. When used in areas of learning and creativity, community-based programming can help better address issues of common concern as well as strengthen our ability to collaborate. Our goal is to manifest a creative network that can sustainably engage with our neighborhood and our planet. This summer, The WasteShed partnered with Chicago Patchwork Farms’ AfterSchool Matters Summer Program to create a creative reuse and entrepreneurship youth program. Throughout the course of this program students learned about growing fresh food in urban environments, and explored the obstacles and resources needed to turn a proposed goal into reality while utilizing reused materials and grassroots organization. The program began by asking the students what they enjoyed about their communities as well as the change they wanted to see. From the very first session, students were candid about the obstacles they face in their neighborhoods. Many wished to feel safer on their block, to see a drug free community, more ethnic diversity. and to see less homelessness on the streets. We engaged in dialogue about the sources of these issues and the lack of resources found in predominantly black and brown neighborhood and how to they could be the source of that forward movement. Through group collaboration, they were able to propose and execute a community fundraiser that would brought visibly to the obstacles they face in their neighborhoods and raised money for a local organization. The Teachers Resource Project is dedicated to making Chicago's educational system more equitable by giving students and teachers the resources they need to succeed. 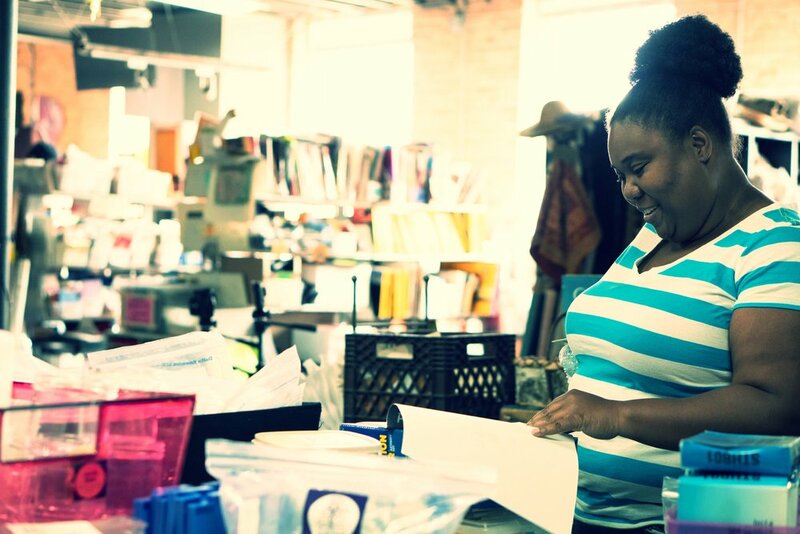 When you donate to the Teachers Resource Project, 100% of your contribution -- after payment processing fees — covers gently-used materials purchased by Chicago teachers at The WasteShed. Teachers are enrolled to the program as funds become available. Each quarter, teachers in the Teachers Resource Project will receive a $60 materials stipend ($20/month) from The WasteShed. Because our inventory is typically priced at half of items’ retail price or less, teachers can afford twice the supplies they could get if they shopped at a regular store. Since teachers spend an average of $500 a year on classroom supplies, a $20 monthly donation can cover one Chicago teacher's annual out-of-pocket expenses in full. Donate to the Teachers Resource Project Today! We would like to thank the Chicago Community Trust’s Young Leaders Fund for making this initiative possible. Our Glass Case Art Gallery took off this year with the help of The Awesome Foundation! 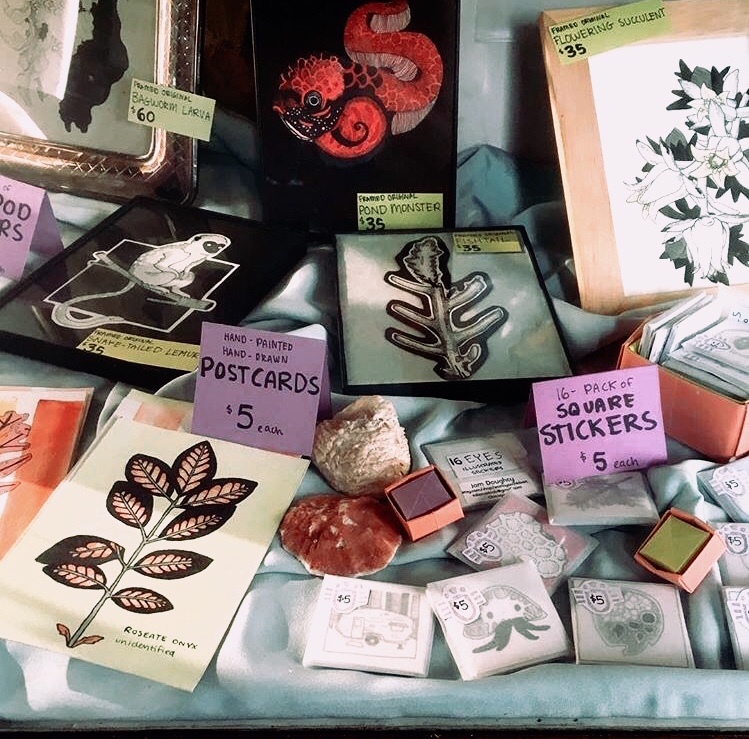 The Glass Case Gallery is a handsome midcentury jewelry case salvaged from the Marshall Fields in Evanston. So far we have showcased 9 different local artists who works with 60% or more repurposed materials, with a particular focus on emerging artists, people of color, and makers who have never or rarely shown their work before. To create conversation, collaboration, and connection among the folks who we currently know as customers and neighbors, but who are becoming a new kind of creative community. These cuties were part of the amazing Jo Jo Baby’s show earlier this year. We taught a workshop at the Museum of Contemporary Art in September! It was cool! Many thanks also to the Lumpkin Family Foundation and the Langer Foundation for their support! We look forward to a bounteous and vivid 2019, thanks to our friends, customers, donors and collaborators. If you would like to make a tax-deductible donation to support our work, you can do so here.